The new IsoFreeze® PCR Rack from Sarstedt ensures consistently cooled PCR samples. 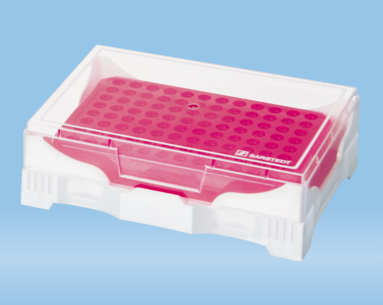 Premature warming of PCR samples during preparation can result in non-specific PCR products. Once pre-chilled, the IsoFreeze® PCR Rack in 96-format for 0.2ml and 0.3ml PCR tubes, strips, and plates can maintain the PCR sample temperature at approximately 4°C for up to three hours in ambient conditions. If sample temperature exceeds 7°C, the rack visibly changes color from purple to pink to alert users. IsoFreeze® PCR Racks are sold in a pack of two so that a warm rack can be conveniently exchanged for a chilled rack during prolonged use.